18 Jan Steady as she goes for weaner steers but heifers providing opportunity. 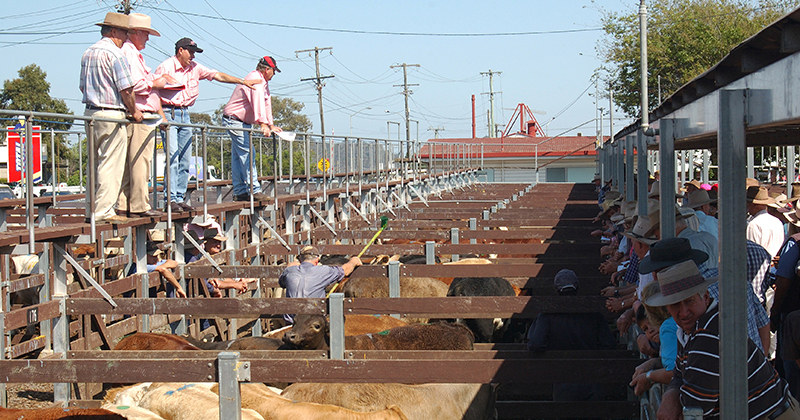 The annual Victorian Weaner festival is off and running, with sales at Naracoorte, Mortlake and Yea last week. This week sees the Hamilton and Casterton sales kick off, and unfortunately for sellers, it has been a dry Christmas and New Year period. For those who are buying, the lack of rain has been good news in terms of prices. Early sales have been around the levels of December. Reports out of Mortlake and Yea last week pegged weaner steers at values around 300-320¢/kg lwt for all steers from 280-450kgs. The flat ¢/kg prices, regardless of weight, is a common indicator of a tough season, and more importantly, a lack of northern buyer interest. When northern buyers are bidding, lighter cattle tend to be at a strong premium to the heavier weaners. Your usual market reports will quote how prices perform versus last year. We like to take a longer range view and look at value. Before Christmas we produced Figure 1 and, unusually we must say, little has changed. We haven’t seen an Eastern Young Cattle Indicator (EYCI) yet, but it doesn’t seem likely to change much. Weaner Steer prices have opened January at a four year low but remain well above historical averages. The Weaner premium to the EYCI at 9.5% is a three year low, but interestingly, still ahead of previous drought impacted sales. Our expected sell price ranges also haven’t changed, but it’s interesting to compare steers and heifers. Heifers are selling at 240-280¢/kg lwt, which makes them a good buying opportunity, given the discount to steers. Figure 2 shows gross margins on converting weaner steers and heifers to light MSA Yearlings. Due to the discount narrowing significantly as cattle put on weight, heifer margins are much more attractive. 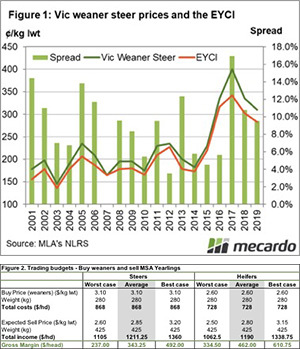 Most steers purchased at weaner sales will be sold as feeders, which are likely to be priced a bit higher at 425kgs, but heifers are offering good returns and probably lower risk. For those able to buy weaners at this time of year, they still look like reasonable buying. They haven’t been this cheap for four years and relative to the EYCI, feeder and finished cattle values they are priced very reasonably. Heifers are worth consideration for buyers. They are much cheaper in dollars per head, especially for those who are looking to finish cattle and sell to processors. Additionally, if we do see a good rain, breeding stock are going to be in strong demand and there will be plenty of upside in females. Since mid-December rain has been largely absent from east coast cattle markets. January weaner sales prices have been relatively steady on December. Steers are selling at a strong premium to heifers, which look like good buying.